Michael Peter Muscala (born July 1, 1991) is an American professional basketball player for the Los Angeles Lakers of the National Basketball Association (NBA). Muscala, (prounounced /muˈSKĂ luh/), was born on July 1, 1991 in St. Louis Park, Minnesota, to parents Bob and Mary. His mother later married Thomas Maida. He has a stepsister, Madeline. Muscala grew up in Minnesota, and attended schools in Roseville, Minnesota, graduating from Roseville High School. Muscala played for the Bucknell Bison men's basketball team for four seasons. He was the 2011 Patriot League Men's Basketball Player of the Year after leading the Bison to an NCAA Tournament appearance. In addition, he was named to the First Team All-Patriot League and AP All-American Honorable Mention in 2010-2011. He was a 2012–13 Academic All-America selection. He was also a 2012–13 Senior CLASS Award finalist. In 2013, Muscala also won the Patriot League Player of the Year, Defensive Player of the Year, and earned First-Team All Conference honors, becoming the first player in Patriot League history to earn Player of the Year and Tournament MVP twice. During his 2012–13 campaign, Muscala also became Bucknell's all-time leading scorer, surpassing Al Leslie's 32-year record. Michael Peter Muscala (born July 1, 1991) is an American professional basketball player for the Los Angeles Lakers of the National Basketball Association (NBA). Muscala, (prounounced /muˈSKĂ luh/), was born on July 1, 1991 in St. Louis Park, Minnesota, to parents Bob and Mary. His mother later married Thomas Maida. He has a stepsister, Madeline. Muscala grew up in Minnesota, and attended schools in Roseville, Minnesota, graduating from Roseville High School. Muscala left Bucknell as the school's all-time leading scorer. Muscala played for the Bucknell Bison men's basketball team for four seasons. He was the 2011 Patriot League Men's Basketball Player of the Year after leading the Bison to an NCAA Tournament appearance. In addition, he was named to the First Team All-Patriot League and AP All-American Honorable Mention in 2010-2011. He was a 2012–13 Academic All-America selection. He was also a 2012–13 Senior CLASS Award finalist. In 2013, Muscala also won the Patriot League Player of the Year, Defensive Player of the Year, and earned First-Team All Conference honors, becoming the first player in Patriot League history to earn Player of the Year and Tournament MVP twice. 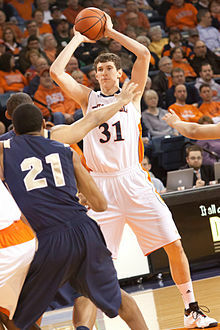 During his 2012–13 campaign, Muscala also became Bucknell's all-time leading scorer, surpassing Al Leslie's 32-year record. On June 27, 2013, Muscala was selected by the Dallas Mavericks with the 44th overall pick in the 2013 NBA draft. He was subsequently traded to the Atlanta Hawks on draft night, and later joined the Hawks for the 2013 NBA Summer League. On August 1, 2013, Muscala signed a one-year deal with Río Natura Monbús Obradoiro of the Liga ACB. On February 25, 2014, he parted ways with Obradoiro and returned to the United States. In 20 games for the club, he averaged 14.6 points, 7.8 rebounds and 1.1 assists per game. 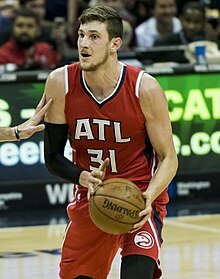 On February 27, 2014, Muscala signed a multi-year deal with the Atlanta Hawks. He made his debut for the Hawks on March 2, recording four points and five rebounds in a loss to the Phoenix Suns. In the team's regular season finale on April 16, Muscala scored a season-high 15 points in a 111–103 win over the Milwaukee Bucks. In July 2014, Muscala re-joined the Hawks for the 2014 NBA Summer League. During the 2014–15 season, he received multiple assignments to the Fort Wayne Mad Ants of the NBA Development League. On March 28, 2015, he had a season-best game with 18 points, 10 rebounds, 4 assists, 1 steal and 2 blocks in a loss to the Charlotte Hornets. Muscala again played for the Hawks' summer league team in 2015, averaging 9.8 points and 7.3 rebounds in six games. On February 3, 2016, he scored a season-high 12 points in a 125–86 win over the Philadelphia 76ers. On March 26, 2016, he was presented with the Jason Collier Memorial Trophy for being the player who best exemplifies the characteristics Collier displayed off the court as a community ambassador. On June 29, 2016, the Hawks exercised the option for the 2016–17 season on Muscala's contract. On July 25, 2017, Muscala re-signed with the Hawks. On March 11, 2018, he scored a career-high 19 points in a 129–122 loss to the Chicago Bulls. On March 28, 2018, he set a new career high and led all scorers with 24 points in a 126–114 loss to the Minnesota Timberwolves. On July 25, 2018, Muscala was traded to the Philadelphia 76ers in a three-team deal involving the Hawks and the Oklahoma City Thunder. On February 6, 2019, Muscala was traded, along with Wilson Chandler, Landry Shamet and a number of future draft picks, to the Los Angeles Clippers in exchange for Tobias Harris, Boban Marjanović and Mike Scott. The following day, he was traded to the Los Angeles Lakers in exchange for Michael Beasley and Ivica Zubac. ↑ "Mike Muscala". Bucknell University. Retrieved October 14, 2018. ↑ "Arnold Konz, 82". Tri-County News. October 27, 2011. ↑ "All-Patriot League, Major Awards Announced for Men's Basketball". PatriotLeague.org. February 28, 2011. Retrieved September 14, 2011. ↑ "Delaware's Elena Delle Donne, Ohio State's Aaron Craft top Capital One Academic All-America® Division I Basketball Teams". CoSIDA.com. February 21, 2013. Retrieved February 21, 2013. ↑ "Hulls Named Finalist for Senior CLASS Award". IUHoosiers.com. CBS Interactive. February 6, 2013. Archived from the original on February 15, 2013. Retrieved February 13, 2013. ↑ "ATLANTA HAWKS SELECT DENNIS SCHROEDER AND ACQUIRE LUCAS NOGUEIRA IN FIRST ROUND OF 2013 NBA DRAFT". NBA.com. June 28, 2013. Retrieved August 7, 2013. ↑ "All-Time NBA Assignments". NBA.com. Retrieved March 27, 2016. ↑ "Atlanta Hawks Re-Sign Mike Muscala". NBA.com. July 25, 2017. Retrieved July 25, 2017. ↑ "LaVine, Portis lead Bulls past short-handed Hawks, 129-122". ESPN.com. March 11, 2018. Retrieved March 11, 2018. ↑ "Towns' franchise-record 56 lead Wolves over Hawks 126-114". ESPN.com. March 28, 2018. Retrieved March 28, 2018. ↑ "Team Acquires Mike Muscala in a Three-Team Deal". NBA.com. July 25, 2018. Retrieved July 25, 2018. ↑ "L.A. Clippers Aquire Chandler, Muscala, Shamet And Two First Round Draft Picks". NBA.com. February 6, 2019. Retrieved February 6, 2019. ↑ "Lakers Acquire Mike Muscala". NBA.com. February 7, 2019. Retrieved February 7, 2019.